This year my goal is to have a wreath on the door for every month. And…I’ve already failed as I missed January! I really wanted to get one up for the month of February this week. Well, yesterday I had a small window of time so I decided to throw one together. It is not perfect, and I’m ok with the asymmetrical look. It’s perfectly imperfect…but at least it is up and it screams AMORE! I had one of the pre-wrapped wreath forms, but I didn’t like the white fuzzy stems. So, I cut them all off and put black chenille stems on it to secure the ribbon. I had some red mesh, the Paris burlap ribbon and while I was at Hobby Lobby yesterday the wooden Eiffel Tower caught my eye. It all came together and I really like it. Of course, these mesh wreaths are so each o pull together as you are just attaching the ribbon and you continue around the wreath form. For March I’m thinking that, instead of St. Pat’s Day I will be making a March Madness wreath in the cardinal red and blue of the UA Wildcats. For anyone following my journey, painful as it has been to watch me drag my feet; move forward one step and then back 2 more; and overall just fiddle-fart around wasting time, you know that I wanted to create my own business being creative with the skill that I have, and ones I would acquire (run on sentence, anyone?). Yes, that has been my dream. 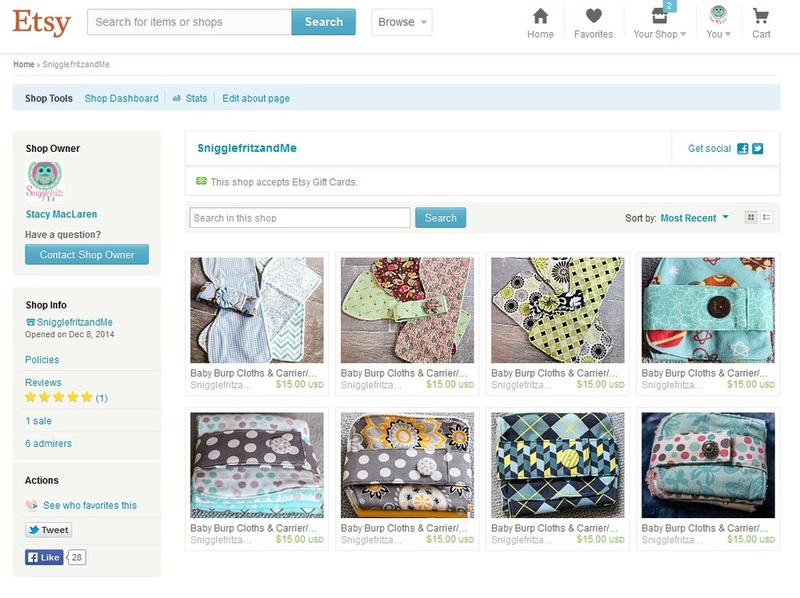 I love to sew, I would love to make money at it, and thus…the idea of Snigglefritz and Me was born. I’m not going to be untruthful; I am scared out of my ever loving gourd at this adventure. It’s a good scared, but still…rejection and failure stink no matter how prepared you are! Of course, that statement right there is ‘glass-half-empty’. Who knows, I may be fully accepted and take off like a shot. More than likely I will follow the steady, slow pace and move along like many other home crafters, at a pace that is happy and blissful. While my whole family supports me 100%, it has been my son is the one who kept on pushing: ‘have you done this yet?’ ‘do you have stock?’ ‘did you sew this week?’ ‘don’t worry about this stuff, just start writing.’ I’m so thankful he did…and does…because he keeps me motivated by sheer determination of not wanting to disappoint! Without him I think my tiny, baby steps would have seemed as though they had no forward momentum. Now I actually can see some serious progress made. I had planned on entering the world of online sales quietly – you know…testing the waters. Well, I put up a photo on my personal Facebook page of one of the sets I made and a friend said ‘I want to buy that’…and she was serious! Boy did that light a fire under my tukas! Then, my mom posted a rave review of what I had been sewing, the custom quilt I had made, etc. on her Facebook page. Um…I hadn’t even gone public with the fact that I was sort of kind of ready to open my Etsy store. Well, guess what? I’m all in now! Snigglefritz & Me is officially open at Etsy. I hope you will consider me when you are looking for a unique baby shower gift. I will post updates on my blog as well throughout the year. Thank you for supporting me with love, encouragement and the pushes I need! I had a "squirrel' moment this week (ok...I may have had more than one!). I think I just needed a break from doing a lot of sewing and I wanted to give my mind a small rest. If you remember back in October, in THIS post, I talked about cleaning and purging. Well, along with that came organizing. Now, I knew I wouldn't complete it all in one massive, energy zapping weekend...however, little by little, the craft room is coming along. I ended up putting a lot of my supplies in baskets on my IKEA Expedit shelves (does anyone else love these things as much as I do? Seriously - they are AMAZING!). While this looks clean and streamline, which is what I was going for, unfortunately you can't see what is inside to know which basket you need to go to for your current project. I wanted a label on each one, but I wanted it to be a cute label. Enter 6 weeks of pinning and pondering what to do! I picked up some cute chalkboard labels, black mini clothes pins and a white pen to help me along. I decided I didn't just want to have plain writing on the labels so I Googled some cute chalkboard doodle ideas and then I just went to town on them. Once the labels had all been created I tied raffia to the basket 'handles' and then used the clothes pins to clip the label to the appropriate basket. I'm quite pleased with how they turned out...and I have plenty of labels left over for anything else - or if I should get more baskets for any shelf space that might open up (um...or new shelving units that might make it into the house in the future!). All Things Sparkly...and a Place to Hold Them! Alright, I have been beating myself up that this project took so long to not only get completed, but also to get posted. Bed, bed crafter/blogger! Finally t is complete - or as complete as this first version is going to get. I have so many statement piece necklaces and earrings that I need to get them out of my poor, overstuffed jewelry armoire...it was so full I couldn't close the doors. To be honest, I think that I had this idea in my head since the beginning of the summer - maybe that is when I started dreaming of it...I'm not certain when I decided to actually put 'feet' to the plan. There are several things that I learned on this project. There are things I don't like, things I would change and things I wouldn't do again. Of course, I think that when something on Pinterest inspires you, the idea seems so much more attainable than the reality! After I had the holes drilled and threads created, I painted the plaque with 2 coats of the chalkboard paint - following the drying instructions on the paint can. Once the paint had dried I prepped the surface (which you really need to do on all chalkboard surfaces, just so the chalk goes on and erases smoothly) by rubbing the side of a piece of chalk all over the surface of the plaque. I then printed the word "Sparkles" in a font I liked, rubbed chalk on the backside of the paper I had printed the word. I lid the paper, chalk side down, on the plaque where I wanted the word to be places, and then traced the word with a pencil. By rubbing the chalk on the backside of the printed word(s) when you trace on the front side, the chalk will then transfer to the surface). Once I had the word traced on the plaque, I used the chalk pen to fill in the letters. I knew I wanted to hang he plaque by a burlap bow, but I also knew that the plaque, once all the necklaces were hanging on it, was going to be heavy. I created the bow and used a staple gun and affix it to the back of the plaque. It is working now, but I would rethink this method for the next one - perhaps making the bow a part of the plaque and using some regular frame hangers on the back. I decided where I wanted it to hang in my bathroom and there you have it. I think I would use a pallet and plan a design using reclaimed wood next time. That being said...I can actually see my necklaces now! i will need to make another one soon because, as I mentioned, I have a TON of these beauty pieces and they are too heavy to fit all of them on one hanging plaque! And as and FYI - your fingerprints will show up whenever you touch the chalkboard surface. The Burlap Canvases are AWESOME!! I have lots of ideas for projects with these lovelies! That being said, they are plain to not add anything to them for a project such as this. I didn't want much on there, but decided that flowers would be perfect. Cut a 2" circle out of felt or cardstock s a base to build the flowers on. Cut approximately12" - 14" of the burlap ribbon. As I mentioned, I used the 3" wide ribbon folded in half. Beginning at the outer edge of the circle, hot glue the ribbon down. Continue gathering and gluing the ribbon as you go around the circle, working inward as you go. I promise to post a tutorial on how I do all of my flowers - however, there are so many tutorials out there for different flowers, you can do whatever style you like. Hot glue a button or embellishment in the center of each flower. Arrange your flowers on or around the edge of your canvas and secure with hot glue. And there you have it. I do not have hardly any of my earrings on this right now, but I will soon! Things have been a little crazy around here. I'm not really sure when the crazy train shifted in to high gear - but it did and so far I'm doing a fair job at keeping up a full tilt sprint just to stay ahead of the locomotive of life! I have so many tasks and projects on my list they just seem to combine together and make a tornado of creativity! Of course, my Type A personality and inner confidence that "of course I can add one more thing on to my schedule" have not assisted me in the keeping up! I feel like I fell short by not having anything posted the past 2 days. I need to stop looking at things that way. I think that if I can get a post up 2 to 3 times a week (not including my Sunday and Wednesday posts) that will be good. Now I just need to embrace that! All that to say, I thought I would just throw a few sneak peeks of projects to come! I'm going to be whipping up some crocheted boot cuffs. Here in the desert it is just too warm, even at our coldest, to wear super thick, chunky socks with boots...but they are so cute sicking up over the top of boots. So, I'm making a few different types. I will get a post up on these prior to our family photos (I hope) on Thanksgiving weekend. I have been working on some jewelry hangers for my statement necklaces and earrings. This was a project I learned a lot of lessons on and I will have a lot to say when the post goes up. I'm working on a sweet quilt for by BFF's Wee One. It's been a great learning curve as I follow a true pattern instead of winging it on my own. I'm snapping photos along the way and plan to have this done by Thanksgiving. Also...on Love To Cook - I'm working on another Soup-er Sunday post this week (still trying to decide on what soup to make, my daughter in-love and I are starting to work on recipes for the cookbook we have been planning for over 2 years (I will post photos from our time in the kitchen for that as we go), and this week I'm hoping to make some Pumpkin Snickerdoodle Cookies. There you have it...some of the stops on the route of the Crazy Train that is my world right now. Since today is the first day of Fall and such (although, here in the desert that is really not a season. I mean, the thermometers are still well into the 90s and the cactus needles don’t change colors! ), I thought I would start a little Halloween wreath to put on the door. I am a week early in putting this up – but I got it done and I wanted to get it out there. I will continue with the rest of the Halloween décor next week once it is actually October! Alas, I gathered all of my goodies and began thinking of how I wanted my wreath to look. When I first looked at the mesh wreaths I thought they looked quite intricate and time consuming. In fact, the most time consuming part is choosing how you want it to look, what colors you will use and how to embellish it. For me, today’s project was a little more time consuming just because I had a few interruptions (lunch with my bestie!) and a dog who kept trying to get her entire 80lb. body between my 2 feet (not certain what that is about…I think she is still trying to figure out why I am home all day!). Alas, I thought I would share my ‘how-to’ on these easy-peasey wreaths. Hopefully, if you haven’t already, you will make one for yourself. For many years I thought you had to have a special wreath form with the wire twists already attached to them. Oh how much money I could have saved myself if I would have only figured out sooner that a very inexpensive wire floral wreath and some chenille stems in a matching color would do the trick quite nicely. I just twist my chenille stems spaced along the wreath form on the various levels of wire. You will be going back and forth with the mesh, so the stems will be covered up. Once you have all of the chenille stems on the wreath form, you will be ready to roll! To start, you pick a place on the wreath and begin by sticking the end of your mesh on the center of your chenille stem and twisting the stem around the mesh to hold it firmly in place (think of a bread twist tie and twist it 2-3 times). Then leave about 10” of mesh before you secure to the next twisty. Make certain to go ‘high’ then ‘low’ on your spacing so that it looks even as you go around. Once you start, you will get a feel for the right amount of mesh and spacing. Sometimes I go around the wreath form twice, and sometimes only once (like here, as I knew I was going to use the smaller black mesh over the orange, and then use ribbon as well). Leave the tails of your stems/twisties long as you will be using them for other mesh or ribbon as you choose. Once you have finished with your base mesh layer (be it one round or two rounds) you can start with your next ‘layer’ of mesh. I used the smaller width in black for my second layer. Again, pick a spot and start twisting the chenille stems around the mesh to secure it…leaving the ‘tails’ for your next layer and/or embellishments. Here is the step that I failed in getting photos – adding the embellishments! After I was done I realized I didn’t get any shots. 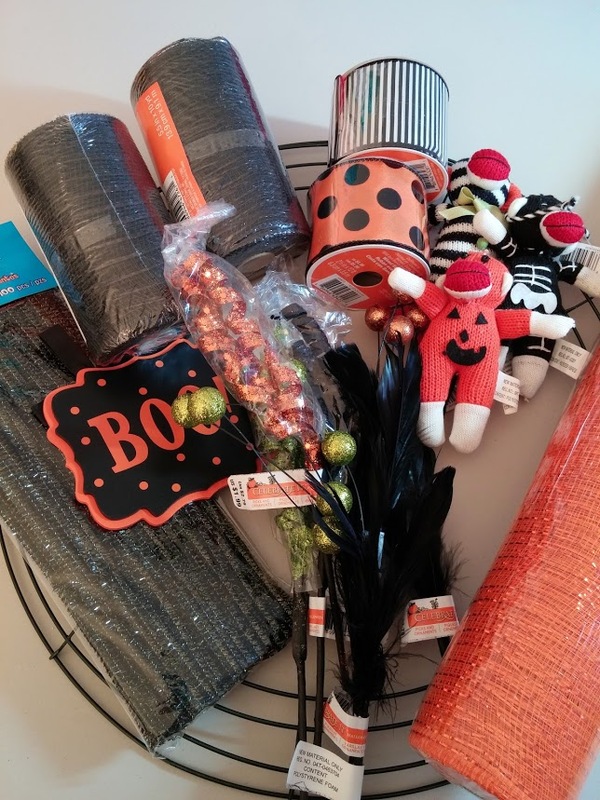 Nevertheless…it is super easy to add them as you are using the chenille twists to secure them on to the wreath at the various places you would like. I like to lay my embellishments on my wreath and play around with placement before I secure anything. Once you add the bow (if you choose to do a bow) then you can go around the wreath with some wire snips and trim down the excess chenille stems so they don’t show. When you hang it on your door you will be able to see where you may need to ‘fluff’ or adjust the mesh/ribbon. Some people use wreath hangers – but our neighborhood has metal screen doors and the wreath hangers make it difficult to close those doors. So, I will weather use a zip tie or another chenille stem to attach the wreath to our door. Both hold up well – the chenille stems seem to do a bit better with the Arizona heat – but use what works best for you. Look at the Target Dollar Spot for embellishments. Catch them right at the start of the season and you will find CUTE stuff for your seasonal wreaths. The Dollar Stores also have several things you can use. Avoid using hot glue on anything for these wreaths. If you are in a hot climate like I am, it will just melt outside. If you are in a colder climate, it will end up cracking and lose its hold that way. You should be able to attach all items with the twisties. Watch Michaels and Hobby Lobby (even JoAnns) for sales on ribbon and mesh. This weekend I found the mesh and ribbon on sale at Michaels for 50% off. When this happens – stock up if you can! The ribbon was the same…which made it $1.50 a roll (10 yards!). They have sales like this often at this time of year. Grab a few jumbo bags of chenille stems. This time around I got sparkly black and plain black. I also have a variety pack in pastels and primary colors. Lil Man arrived in this world on May 5th. For anyone counting, that’s 4 months ago this coming Friday. And over her at Gigi & Pops…we prepared the nursery/playroom as well. The one thing I never did for our house was make burp cloths. I made the kids some for the Star Wars theme…so cute. I figured I would get around to making some for our house – I just didn’t think it would take this long! I have a girly version of the cloth diaper burp cloths…as craft cloths for the craft room. Not really appropriate for a Lil’ Man! So, on Monday I figured I might as well keep on sewing after I created THIS lovely! I had a stash of some wonderful Cuddle terry cloth fabric (hence the title of the post) as well as an adorable 6 pack of flannel fat quarters from JoAnns. I opted to make them very simple and in a different manner then the ones made with the cloth diapers (not that I don’t like those – I think every home with a newborn should have those type – cloth diapers are AWESOME for everything. Hence the reason I use them in my craft room!). What I didn’t know was just how much this cuddle material sheds! Mercy, oh my soul! I even threw it in the dryer beforehand (a trick I learned with minky fabric) and it till was shedding like a sheep escaping its coat! Nevertheless, I powered through and got these cuties done. Hey are super simple: just cut the fabric in 10”x18” rectangles; sew with ¼” seams wrong sides together leaving a 3” opening on one of the sides to turn (don’t forget to back stitch at the start and stop of your seams); turn right side out and press; top stitch with a 1/8” seam all the way around closing the 3” opening as you go. Wash & dry and you are ready. These would be super cute embroidered with the little’s name, or with ribbon trim or piping. Can I just say that I would now like a personal blanket made from this stuff. It feels heavenly. Perhaps that is another project for another day. I’m heading out to Salt Lake City in a little over a week for the first ever Click Away Photography Conference. I’m so very excited – and very nervous/scared at the same time. I don’t usually do things like this alone (not that I will be alone, 1000+ other photographers of all skill levels will be there as well). However, I decided many months ago when I signed up that, if I am really moving in a new direction, then sometimes I’m going have to go it alone. After all, I’m the one responsible for improving my skills, challenging myself and feeding my creative side. So, I’m going to do it…4 days by myself. It’s a good thing I have been to SLC several times before – at least I somewhat know my way around so I can explore a little prior to the conference. Nevertheless, I’m still a little scared that I won’t meet any new friends or make any connections. I know – so high school – that’s me! OK, all of that to say this: at any conference/convention you meet some amazing people. Some of them become close friends that stay in your life for many, many years. Some of them are great connections and inspiration to you on your journey. When you meet, you are always looking for a pen and paper to exchange number. In this instance I have no doubt we will all be exchanging business cards. My cards are being designed by my best friend and creative soul at SweetHeartCreative. I can’t wait to get them…she’s awesome (I will post soon about my planner that she created for me!) To that end, I wanted a cute card holder not only for my own cards, but for those I receive. This meant some time with Eleanor this morning! I had done some searching on Pinterest as well as a good Google search to find some tutorials and ideas. What I got was business card holder OVERLOAD! So much cuteness out there! What I landed on was an amazing tutorial from Free Spirit Fabrics. They have amazing fabrics to drool over! You can see the tutorial HERE. I decided on some patterns from a fat quarter bundle I had gotten a few years back from Fat Quarter Shop. The patter is a Riley Blake pattern, designer Jen Allyson and it’s called Lost & Found. This is the original Lost & Found pattern and I LOVE it beyond words. I think that is why it took me 2 years to do anything with it…I didn’t want to cut it! So, I jumped in. I didn’t have a clue how long it would take. I mean, it’s not that big, however ruffles and interfacing and tiny spaces to turn right side out make me nervous. I started at 8:30 and I was done before 10. That made me very happy (I mean…I had a lot on my to-do list for my restful Labor Day!)! I got it all together and I couldn’t be happier. I want to make another one that will hold a few more cards (just so I’m not continually reloading my case), but honestly – it makes me smile whenever I look at it! And now to decide on fabrics for the next holder! My project this weekend was to make a birthday dress for my favorite almost 2-year old. She is precious and belongs to my best friend. I adore this child as if she was my blood relative, and I have since I saw her first sonogram photo. The minute she drew her first breath I knew I was a goner – hook, line and sinker! I will always be her crazy Aunt Stacy! When her momma asked if I would be able to sew BabyGirl a dress, of course the answer was “yes”. And as soon as she said the theme was Minnie and Olivia (she loves both characters…especially Minnie) I knew exactly the colors as well as the style. After that it was just a matter of finding the time. A quick glance at my schedule, thing already written down and those I knew were still to come, and this was clearly the weekend it had to be done. Considering the party is next weekend, I was cutting it close! So, here we are at the close of the weekend and we have a completed dress AND a matching purse. I am quite happy with the end result. The purse was a total creative free-for-all as I came up with the idea in the middle of the night and figured out the pattern as I went along. The pattern I used was a pillow case dress from Whimsy Couture, with a few modifications to the ruffles. Whimsy is one of my favorite pattern shops on Etsy. She just designs great patterns and they are easy to follow and execute. Of course, I find it very easy to spend $$ in her shop as well! All fabrics were picked from the quilt cottons wall at JoAnn Fabrics – their line of fabrics. I love this dress so much I’m actually dreaming of a quilt design to incorporate the ruffles. Not sure when I will be able to complete said quilt…but it’s running around in my head! I’m looking forward to working on more creations soon for this little Wee One.